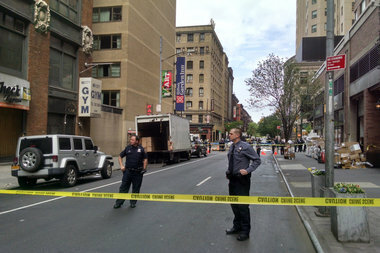 A man was fatally shot and a woman was grazed by police gunfire in Midtown Wednesday morning, officials said. MIDTOWN — At least 22 bystanders have been hit by stray bullets in police-involved shootings in the city since 2010 including an incident in Midtown Wednesday, according to NYPD statistics and reports. Police grazed a female bystander's arm after fatally shooting a knife-wielding man on Eighth Avenue and 49th Street around 8:30 a.m.
During the past five and a half years nearly two dozen civilians have been struck by bullets in NYPD-involved shootings, records show — four of them fatally, including Akai Gurley in an accidental 2014 shooting that led to the manslaughter conviction of former police officer Peter Liang. In 2012, nine bystanders were hit by police bullets after gunman Jeffrey Johnson hunted down and killed his former boss a outside the Empire State Building. According to the NYPD’s Annual Firearms Discharge Report, officers are not allowed to use “deadly physical force” unless they have probable cause to believe they or another person are in imminent danger. “Police officers shall not discharge their weapons when, in their professional judgment, doing so will unnecessarily endanger innocent persons," the report said. The NYPD did not return an immediate request for comment. According to Maria Haberfeld, a John Jay College professor who researches police use of force, officers are trained to shoot center mass — or the middle of the body — which reduces stray bullets. But it can be difficult for an officer to immediately know if they struck their target in a very stressful situation. "[There is] tremendous stress that impacts the way officers see things, perceive things," Haberfeld said, adding that the NYPD could teach additional coping mechanisms to help officers deal with the daily strains of the job. "We don’t give police officers any stress management training," she said. "This is exactly where we are paying the price." A witness during Wednesday's shooting said the officer who fired at the knife-wielding man appeared shaken afterward. "The cop started crying immediately. You could tell he was remorseful for what he had done," said Anthony Tessitore, 27. Haberfeld also said that instituting an older age requirement of 25 for NYPD recruits could help officers handle intense situations because, "[You have] emotional maturity at an older age." Currently, recruits must be at least 21 years old on or before their date of hire, according to the department's recruitment website. Still, Haberfeld said it would be difficult to institute any additional rules governing exactly how and when officers use deadly force since the situations are very complex. "[An officer's] primary focus is on someone else’s life or [their] life is in danger," Haberfeld said. "[There's] never enough time to asses properly what’s happening around you."